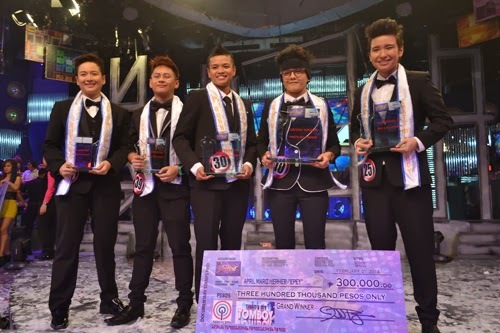 Showtime has its first ever grand winner in its segment called “That’s My Tomboy” in the person of April Mariz “Ebey” Herher. She took home an amount of 300, 000 php as the grand price. The said contestant showed not just her talents but also skills in answering questions. The good thing about this winner is that her prayer not for herself but for he deserving winner. She also thanked Showtime for giving her the opportunity to show her talents and the things that she can do in order to be accepted to the society. Because of winning the price, she gave glory to her native land “Mindoro”. (from left) Kim Andaya, Phao Faraon, Kim Orencio, Epey Herher and Sky Teotico. There are several comments with regards to the show as others are saying that the show is tolerating the other personality but it goes to show that we cannot please everyone. Because of the show, we will not just look at them as individuals different from us but also individuals capable of showing their talents. Congratulations to April Mariz “Ebey” Herher for bringing home the title of being the very first “That’s My Tomboy” contest.